When dinner is this delicious, and the cleanup can be done in a blink of an eye, there’s no reason not to make this Easy Maple Mustard Chicken Thigh Sheet Pan Supper, tonight! 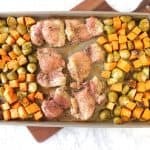 With the popularity of sheet pan dinners going through the roof, I wanted to bring you a recipe that would utilize some of autumn’s best-tasting vegetables and flavors, along with the always popular, moist and meaty, boneless and skinless chicken thigh. 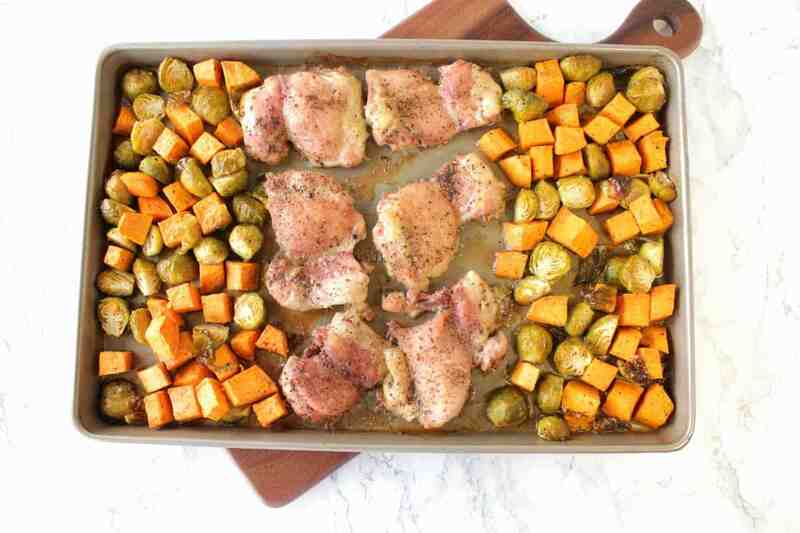 The result is this incredibly flavorful and Easy Maple Mustard Chicken Thigh Sheet Pan Supper. I used Brussels sprouts and sweet potatoes as my autumn vegetables, but any variety of winter squash would also work well. As long as you cut the squash into smaller size pieces so they’ll cook in the same amount of time as the chicken, you’re good to go. The time it takes to prep this sheet pan dinner is minimal. Maybe 15-20 minutes. Enough time to marinate the chicken breast, peel and cut the the sweet potatoes, and trim and halve the Brussels sprouts. However, with all the time saving products and ingredients you can find in the market these days, if you can find the sweet potatoes and Brussels sprouts already prepped, even better if you’re not in the mood to wield your chef’s knife. 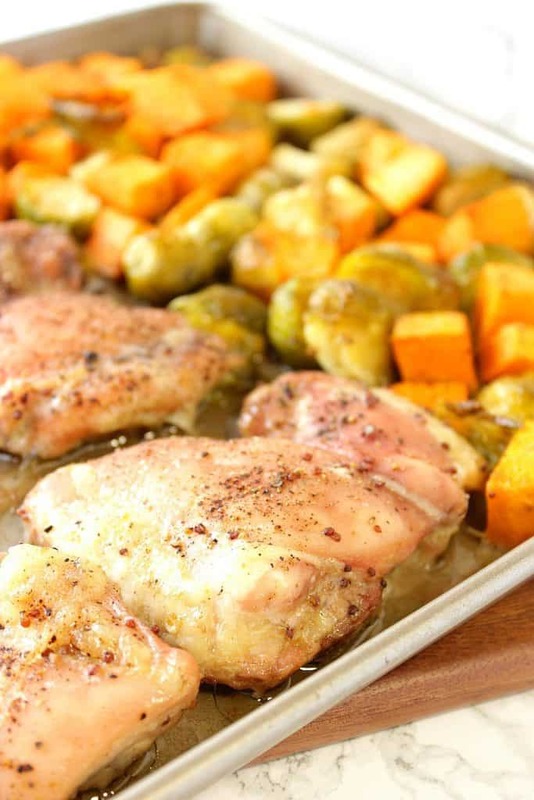 Are you ready to cook the Easy Maple Mustard Chicken Thigh Sheet Pan Supper? Me too. Let’s get busy! Assemble the chicken marinade ingredients: pure maple syrup, stone ground mustard and lime juice. Whisk all the ingredients in a small bowl. …and trim (cut off the bottom and remove the outer leaves) the Brussels sprouts, and cut in half. Place the prepared sweet potatoes and Brussels sprouts in a large bowl. Add grape seed oil (or other light flavored oil), salt, pepper and freshly grated nutmeg. Toss well. 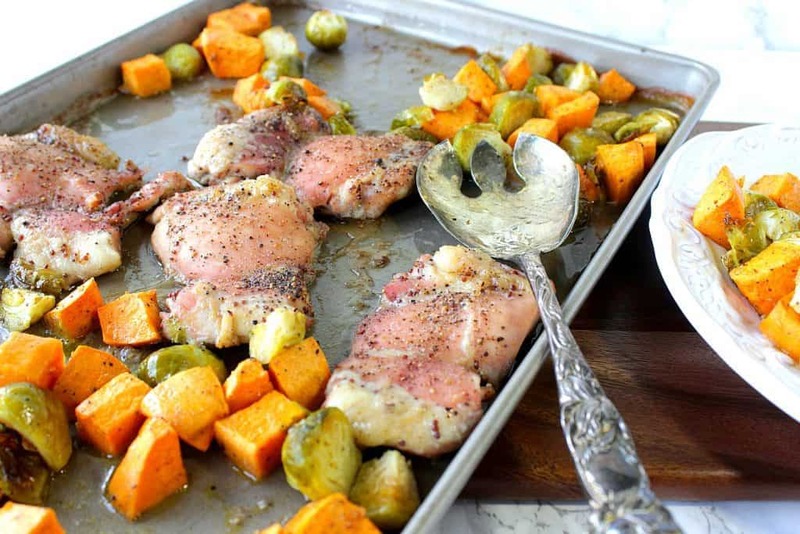 Place the seasoned sweet potatoes and sprouts on a 9 x 13 sheet pan, along with the marinated chicken thighs. Discard the remaining marinade left in the bag. Season the chicken thighs with salt and pepper to taste. Bake in a preheated 375 degree oven for 40-45 minutes, or until the chicken is cooked through and the vegetables are fork tender, and caramelized. 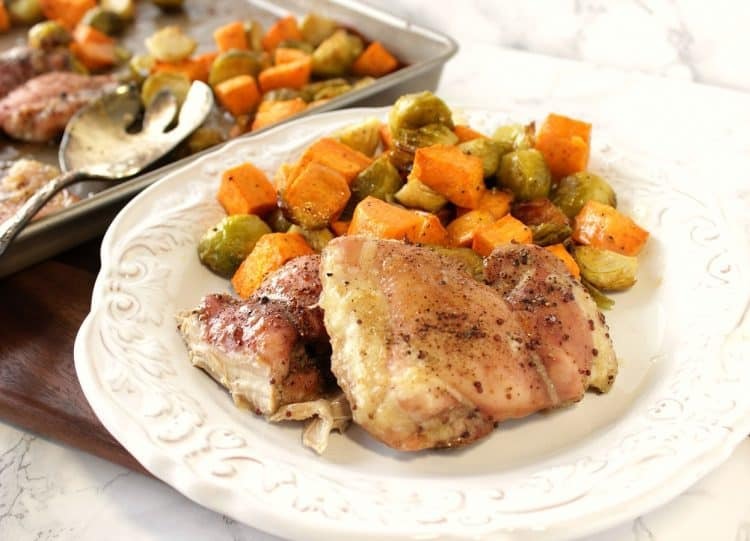 The following Amazon.com items are some suggested products I’ve chosen that will aid you in the making of this Easy Maple Mustard Chicken Thigh Sheet Pan Supper, if needed. By clicking on the photos, you’ll be taken directly to Amazon.com website if you’re interested in purchasing any of these products. You are in no way required to do so, and you will not be charged in any way unless you decide to purchase a product. When dinner is this delicious, and the cleanup can be done in a blink of an eye, there's no reason not to make this Easy Maple Mustard Chicken Thigh Sheet Pan Supper, tonight! Whisk the maple syrup, mustard and lime juice in a small bowl. Add the chicken thighs to a large zip top bag and pour in the maple syrup marinade. 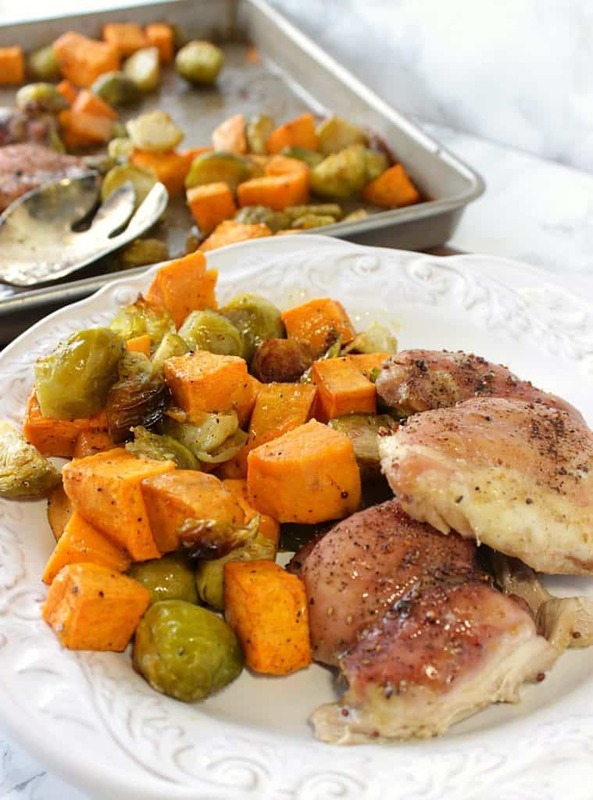 Allow the chicken to marinade at least 20 minutes while you preparing the sweet potatoes and Brussels sprouts. Place the sweet potatoes and Brussels sprouts in a large bowl. Add the grape seed oil, salt, pepper and nutmeg to the potatoes and sprouts. Toss well to coat. Spread the potatoes and sprouts evenly on a 9x13 sheet pan. Add the marinated chicken to the sheet pan and discard any remaining marinade. Season the chicken thighs with salt and pepper to taste. Bake in a preheated oven for 40-45 minutes or until the chicken is cooked through and the vegetables are fork tender and caramelized. 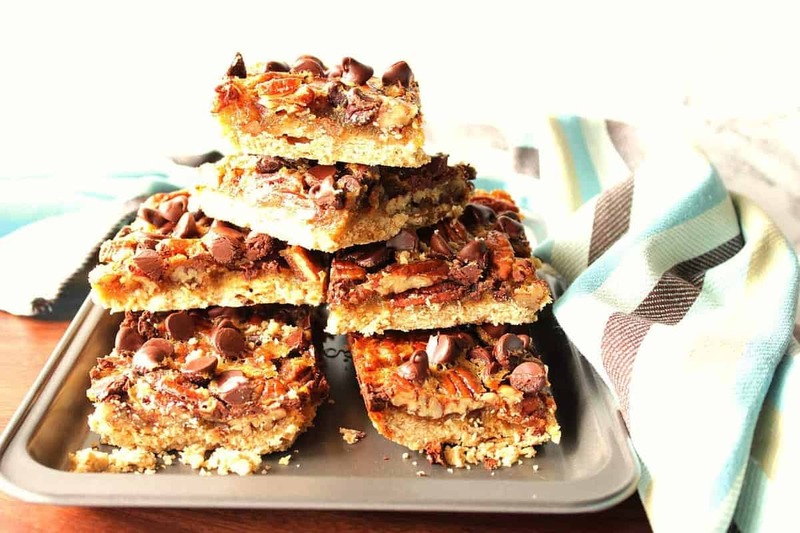 10 Easy and Simple Sheet Pan Recipes – Damn Delicious. If there is ever anything I can paint for you, from glassware and ceramic tiles, to fabrics (aprons, tea towels and book bags), please don’t hesitate to visit one of my shops: Etsy and Wazala OR contact me via email: info@kudoskitchenbyrenee.com Custom orders are always welcome, and I will happily paint and design from any idea, photo or description you send my way. 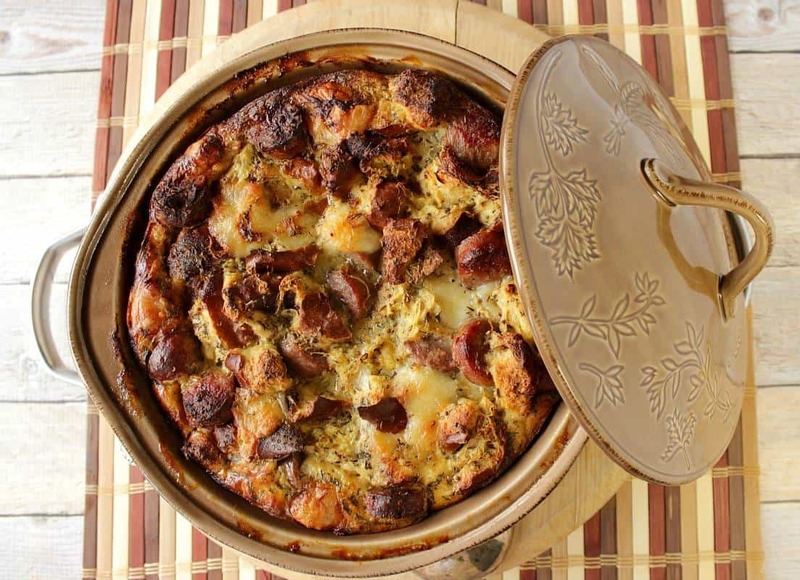 This looks the perfect, weeknight meal! Love it! Thanks, Lauren. It couldn’t be simpler. We would love this for dinner at our house! So flavorful and delicious! Great recipe! Thank you, Sheena. So glad you like it! So easy and filling. 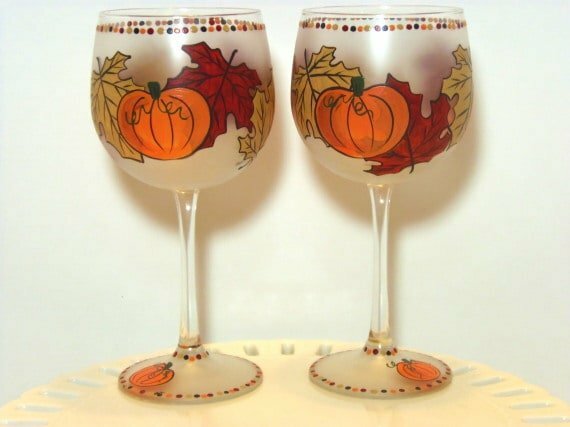 This is something my husband could even make! I have fallen in love with sheet pans! I am going to have to try this one soon! Thanks, Krista. I think you’re going to love it! I’m just slightly addicted to sheet pan dinners, so I can’t wait to try this — love the idea of maple in the fall! Thanks, Dee. I know you’ll love it! This looks so perfect for dinner tonight!